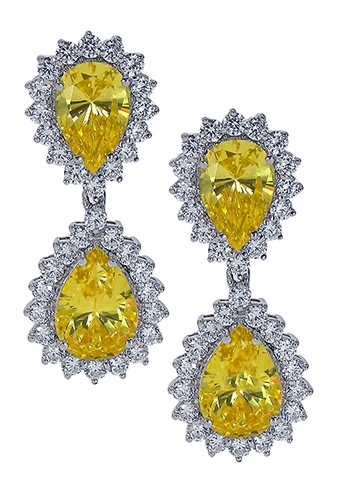 The Ecstasea Canary Pear Cubic Zirconia Cluster Halo Drop Earrings offer an exquisite touch for the perfect occasion. A 4 carat 13x9mm pear cut is suspended from a 3 carat 12x8mm pear and surrounded by basket set cubic zirconia rounds. The earrings measure approximately 1.5 inches in length with post type backs. These halo drop earrings are are available in various color stone options that include mad made ruby red, sapphire blue and emerald green gemstones in addition to simulated canary yellow, pink and diamond look cubic zirconia. 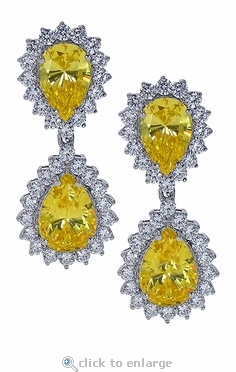 The earrings have movement and are offered with standard push backs. Large backs are available as an upgrade for added security and comfort, please see the pull down menu for options. For further assistance, please contact us directly at 1-866-942-6663 or visit us via live chat and speak with a knowledgeable representative. A matching necklace is also available, please see item N1036.